The winery at 904 Hamburg Street will be open on September 1 and 3 from 10-6 for the release of the 2010 red wines, Cabernet Sauvignon, Cabernet Franc, Syrah, and Petit Verdot and the Annual Vineyard Tour at 4288 Kinkead Road. Enjoy food, music and , of course, WINE throughout the afternoon from 12-5 on Saturday, September 1st and Monday, September 3rd. We are happy to bring back Lee Ann O'Rourke, vocalist and acoustic guitarist from Northern Kentucky. Lee Ann has a passion for the music of Joni Mitchell, The Eagles, Sheryl Crow, as well as The Beatles. Cara Bella Organic will be providing a delicious variety of appetizers paired with each of La Vigna's wines. Cara Bella Organic is a local company offering fresh, local food for any occasion. Had the chance to attend the “yes, you really just got tenure” celebration for one Dr. Chris Sullivan not long ago. One of the partygoers was his neighbor John, who is affiliated with Banfi wine importing. Banfi, in addition to their own Italian wines, imports and/or manages a portfolio of 25+ new and old world wines. You’d probably recognize some of the wines: Bolla, Mont’Albano, Riunite, Little Black Dress, Trivento, and a number of others. Concha Y Toro 2009 Serie Riberas Gran Reserva Cabernet Sauvignon – Concha Y Toro is a Chilean winery known best for reasonably priced, solid wines. I’d not had a chance to try the Gran Reserva series. Cracked, poured, swirled, and was rewarded with a nose of smoke, cedar, dark fruit and a little alcohol. The flavors were quite soft for a young cabernet. Plenty of blackberry and cherry on the palate followed with some easy-access tannins. The finish is reasonably gentle and balanced, with tannins building after a few drinks. I could certainly see this as a quality porch wine you’d crack with some friends. With food alongside, we had it with some “mini meat loaves” and rosemary potatoes and it went along quite nicely. I think any kind of roasted meat would work here, especially if you go light on any sauces. At $15, quite a decent bottle. Rainstorm 2009 Pinot Noir – Rainstorm is made by VinMotion, a “Pacific NW winery.” VinMotion used to be Washington’s Pacific Rim Wines, but has expanded its reach with Banfi’s assistance with Rainstorm, which focuses on Oregon pinot noir and pinot gris; and Sweet Bliss, a series of “sweet wines” that includes a red, a white, and a rosé. Having just returned from Oregon, I had a reasonable idea of what an “Oregon pinot” would taste like (even though there’s an incredible amount of variation – but that’s for a future column). Oregon pinots tend to be a little pricier, and I was concerned with an $18 pricetag that I might be pouring a pinot that would be a little overly fruit-forward and high-alcohol for “Oregon style.” I was glad to see that the winemakers did their collective homework. Within this funky bottle lies a line with a slightly fruity, semi-smoky nose. Rather than being fruit-forward, the flavors are restrained but emerge quickly after a couple of sips. I wouldn’t call it “elegant,” but there’s much more subtle licorice and blackberry flavors than the cherry attack you’ll see in many inexpensive pinots. Finish is gentle and a little smoky. At this price point for a decent, relatively uncomplicated Oregon pinot, it’s surprisingly good. I’d give it a whirl again if I were in the mood for such. I love doing flights of almost anything. A “flight” usually refers to a set of small samples of wine, but can be beer, whiskey, cola, orange juice, coffee…you get the idea. In general, I differentiate “doing a flight” from a “tasting” since there’s almost always a fun, social aspect involved. Comparing notes with your slightly-buzzed nearest and dearest across a table strewn with glassware is good times, yo. After shaking off the previous evening’s revelry, the Sweet Partner in Crime and I left our hotel (the Monaco…a cool place!) for a day-long meander around the city. While Portland has a world-class public transportation system (in the eyes of practically everyone except dillweeds like Ohio’s Governor John Kasich and U.S. Rep. Steve Chabot), the city is eminently walkable. Our plan was to have a look around Old Town and buzz through Chinatown for some lunch before heading over to the Pearl District. After an intentionally aimless stroll, we turned a corner on the edge of Chinatown and came upon the Lan Su Chinese Garden. 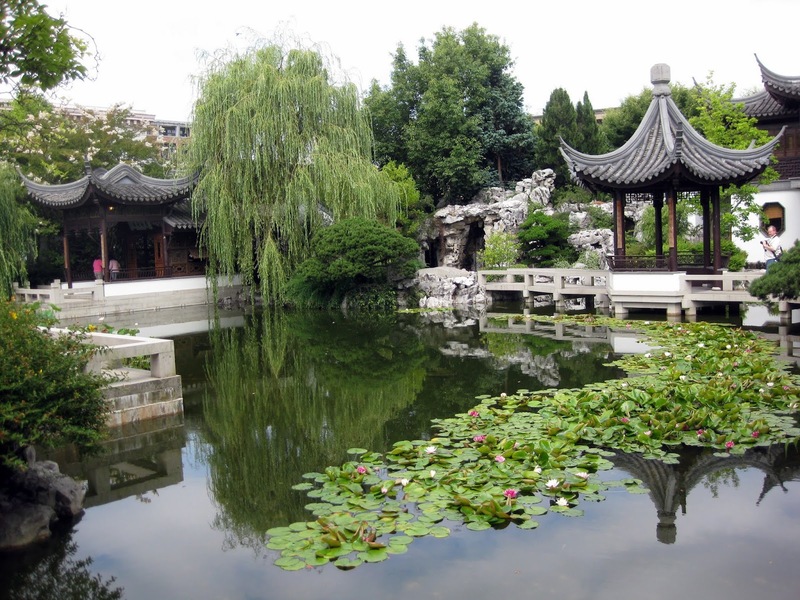 Portland is best known for the Rose Garden and the adjacent Japanese Garden – but we’d read (correctly) that the Chinese Garden was also not to be missed. From the outside, one wouldn’t know just how peaceful and beautiful this place plopped in the middle of a major city was. On one corner of the garden stands the tea house. Since lunchtime was still a bit away, we stopped in to discover that they offer flights of loose leaf teas. Since I had little notion of good tea beyond Celestial Seasonings, I was intrigued. Our server, Martin, was very patient and helpful as he explained to us the differences between the various offerings. We opted for a flight of three “old growth” teas – two green teas from different mountain regions in China and a black tea from Vietnam. I drink a fair amount of “normal” tea. 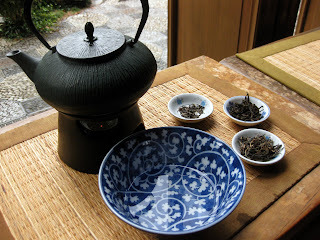 I’d never thought much beyond a basic “tea” flavor – and I’d never really associated terroir with tea. But there it was. 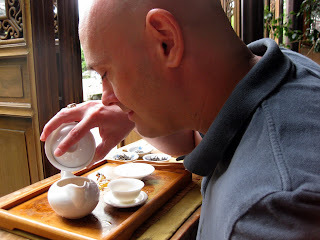 The flavors of the Chinese teas were quite different – one was earthier, the other a bit more tannic. And the black tea was another beast altogether. More important was the preparation ritual, which I clumsily attempted to emulate. Quiet, contemplative, peaceful – looking out across lovely intricate patterns of water and stone – we lost ourselves in tea and serenity for over an hour. Marvelous. Our walk resumed, our delicious Chinatown lunch was at a pan-Asian bistro called Ping. I had a fabulous kuaytiaw pet pha lo (a Thai-Chinese combo of a duck leg stewed in mushroom broth over fat fresh noodles). The SPinC enjoyed her yam yai (“big salad” in Thai). The food was delicious, but I was mesmerized by the discovery that Ping offered flights of shochu, which I’d always wanted to try. Shochu is a Japanese alcoholic beverage. Like sake, it’s clear and can be served hot or cold. That’s where the similarities end. Sake is generally made from rice, is brewed in a similar process to beer, and is usually around 13-15% alcohol. "I've smelled moldier in my sock drawer!" Shochu can be made from basically any substance that contains convertible starch – rice (including leftover grain from sake production), buckwheat, sweet potatoes, molasses, potatoes, and so on. The raw material is steeped in water, steamed, and cooled. The resulting glop is treated with a mold called koji. The koji breaks the starches down into fermentable sugars. After several days of fermentation, the product is distilled, producing clear, 50-ish proof liquor with a distinct flavor. I did a flight of three shochu: one made from rice, another from buckwheat, and a third from molasses. (I think the idea of a moldy drink scared the SPinC.) How were they? 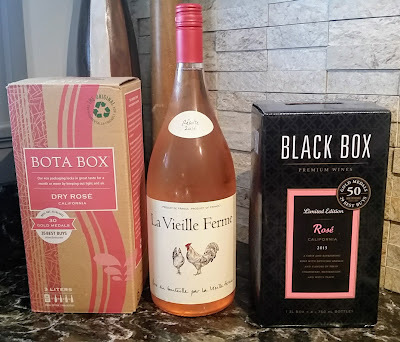 None of them will replace wine in my beverage rotation anytime soon. I did like the one from molasses, which maintained a bit of that blackstrap sweetness. Next time I’ll try the sweet potato shochu. It was still a little early in the day with the Pearl’s breweries still in front of us. Flight #3 – Beer! At last, Beer! 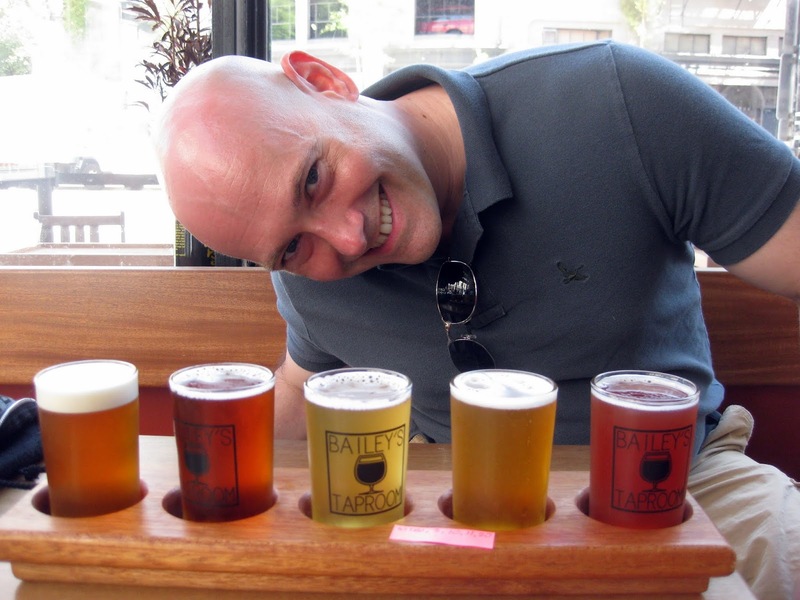 We hoped to hit the Pearl’s “Brewery Blocks” for afternoon flights of local beers. As my beer drinkers know, there’s some good beer from Oregon. Alas, we discovered that, like the Manhattan’s Meatpacking District, “Brewery Blocks” now apparently refers to the former tenants of those buildings. The former brewery spaces are now largely retail spaces and upscale condos. We went looking for ales. We found Anthropologie.This gentrification was nicely done, mind you – but fantasies of little beer tasting rooms were dampened. Slightly disheartened, we headed back towards the Monaco. 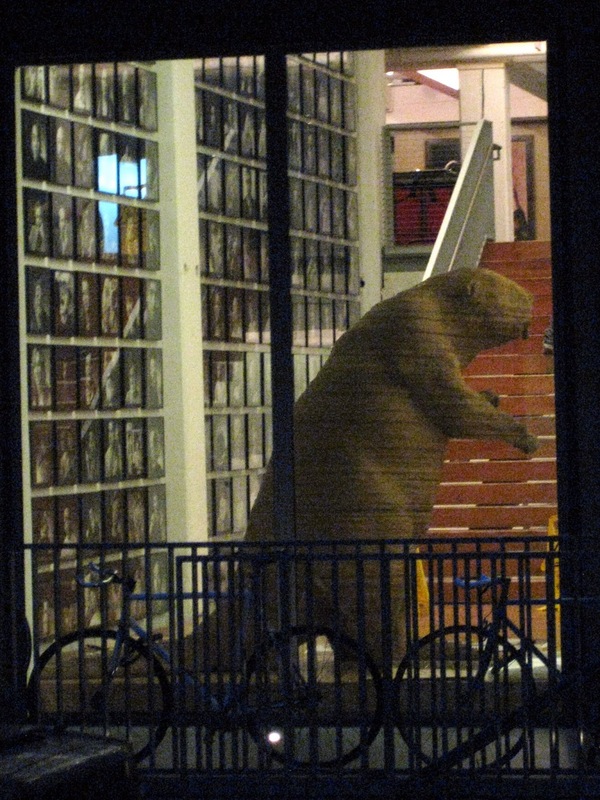 Rounding a corner on our circuitous route, we saw a bar-front for “Tugboat Brewing Company,” but our bubbles burst as we discovered the door locked. 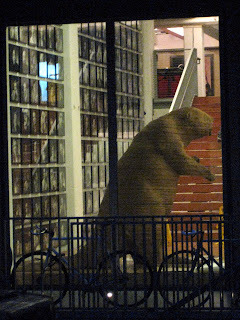 Frustrated, we turned around and – to our joy and relief – saw a sign for “Bailey’s Taproom” directly across the street. With a giant flatscreen menu of 20 Oregonian beers on tap, we’d struck gold. We shared a flight – a couple of IPAs, a cask bitter, a hefeweizen, and a framboise. Since we’d been doing a limited-carb diet leading up to the vacation, these were the first beers we’d had in a month. I might have given thumbs up to an Old Style at this point. They just tasted GOOD. Before we headed off to dinner at a highly-recommended-but-ultimately-disappointing meal at a Peruvian place, we stopped at Oregon Wines on Broadway, a wine store and tasting. Wine tasting was heavily on the agenda for the remainder of the trip. We had names of a few places from friends and travel guides, but we weren’t as familiar with the geography, which winery specialized in what style of pinot noir, etc. Eager to learn, we bellied up to the tasting bar and our tastress Emily (who sported some of the most stylish body art you’ll ever see) lined up six Oregon pinots for us from producers large and small. This sloth loves Oregon pinot. Really. First, let me send another thank you to the good folks at Folsom who sent along a few of the whites from the Big House line of wines for sampling. Big House is a value-priced line of wines from Underdog Wine & Spirits. Underdog also makes Cupcake, Fish Eye, flipflop, and Octavin wines. Big House’s winery is basically across the street from the Soledad State Correctional Facility in Mendocino County, California – thus creating the obvious inspiration for both the name of the wine and the nicknames of many of the individual varietals. Big House White 2011 – This white is a “field blend” of 10 primary varietals, plus whatever else they have around at the time. The largest chunk of the wine’s composition is Viognier (about 27%), followed by Malvasia and Gruner Veltliner. With a backbone of Viognier, I wasn’t surprised to find the nose rather perfumey. You can’t miss the floral characteristics unless your sinuses are acting up. Flavorwise, I got melon & tropical fruit flavors with a little bit of sweetness from a little bit of residual sugar. The finish is fruity and a little fat. I thought it tasted like an inexpensive Viognier without the oiliness common to many of those wines. A decent enough summer quaffer if you’re looking for something that’s aromatic. Big House 2011 “Unchained” Naked (Unoaked) Chardonnay – I’m not a big fan of many California chardonnays because they’re usually heavily oaked and buttery. Some winemakers have tried producing unoaked chardonnay with mixed results. The big drawback to many of these unoaked specimens is a lack of acidity. When I tried the Unchained, I was pleasantly surprised to discover some tartness. (Now, it’s not super-acidic, mind you.) Lemon and green apple were major flavors. The body had a decent amount of weight and the finish was reasonably crisp. I thought it was OK, but I wouldn’t classify it as one of my favorite bottles to just slug on. Steak tacos were on the menu for the evening, and I hoped there’d be enough oomph within to handle them. With the beef, greens, avocado, and onion – everything was fine. As soon as I dolloped some spicy salsa on there, game over. The capsaicin just ran the flavors over. 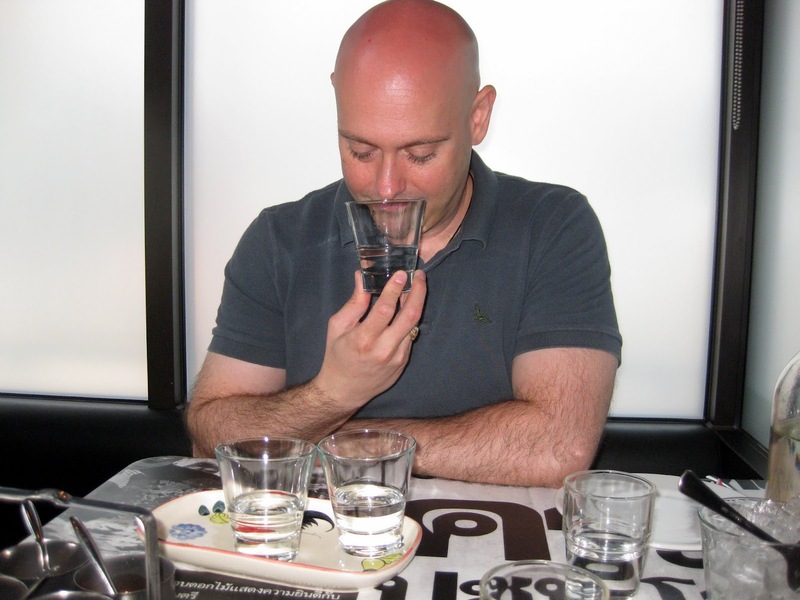 Lesson learned – it’s a flexible enough food wine, as long as you aren’t eating spicy. Big House “The Birdman” 2011 Pinot Grigio – Again, this pinot grigio wasn’t exactly what I expected. Many pinot grigios are either highly acidic or downright watery. Neither was the case here. I found this to be quite full-bodied for a pinot grigio – and I certainly wasn’t expecting one which had lemon flavors that sat on my tongue for any length of time. That lemon is crossed with a strong dose of tropical fruit, especially pineapple. The finish is much more fruity than crisp. If I weren’t paying much attention and was looking for a wine to slug on, it was decent. However, I like more crispness in my pinot grigio. This one just wasn’t my speed. Big House also offers Big House Red, “The Usual Suspect” Cabernet Sauvignon, “Cardinal Zin” Zinfandel, “The Slammer” sweet Shiraz, and “Grü-V” Grüner Veltliner. Big House’s wines generally retail for around $10. Three liter “wine casks” are usually around $22.